Il Medico Omeopata is an international journal of Homeopathic Medicine. It is published by FIAMO and is aimed at doctors and veterinarians. The journal was founded in 1995. Three issues are published a year, both in print and digital formats. The aim of Il Medico Omeopata is to promote and develop Classical Homeopathy, also known as Unicist Homeopathy. This method of therapy was devised and perfected by the German doctor and scientist Christian Friederich Samuel Hahnemann between the second half of the eighteenth century and the first half of the nineteenth century. 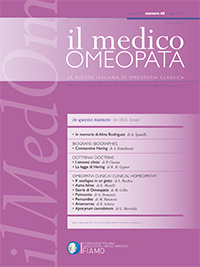 Il Medico Omeopata is published in Italian: the leading articles appear both in Italian and English. The articles that will be considered for publication must be original or have had restricted circulation and, due to their quality, deserve to be made known to the entire homeopathic community. Il Medico Omeopata publishes articles on clinical practice, research and the history of homeopathy. Each issue contains information, conference reports, reviews and numerous features of special interest to the global homeopathic community and Italian homeopaths in particular. The journal focuses on human and veterinary practice, with articles that provide practical evidence of the therapeutic potential of homeopathy, following the approach defined by Dr Samuel Hahnemann in the first chapter § of the Organon: The doctor’s sole object is to make sick men well and this is called healing. In terms of research, the emphasis is on the pure experimentation of substances, known as Proving: HDP = Homeopathic Drug Proving. The articles in the latest issue can be read on the site. The page For Authors provides guidelines for publishing material in Il Medico Omeopata. All the articles in previous issues can be consulted in the archive, providing access to hundreds of human and veterinarian clinical cases and to many invaluable articles for study and research in the field of homeopathy. The interview section provides an opportunity to learn about the ideas of numerous contemporary homeopaths. The Homeopathic Schools section presents the Italian schools of the FIAMO Training Department for basic and advanced training in Homeopathic Medicine with profiles, a brief presentation and lists. The Conferences and Seminars page provides information about courses, seminars and conferences. The FIAMO page – the Italian Federation of Homeopathic Associations and Doctors – presents the leading Italian homeopathic federation: its aims and organisation. The ECH page – European Committee for Homeopathy – contains information about the leading European homeopathic association. The LMHI page – Liga Medicorum Homeopatica Internationalis – contains information about the leading world homeopathic association.